Gold has historically been used as a symbol for everything from devotion to wealth and power. It is thought it might have been the first metal ever used by humans, possibly for the worship of gods and idols. In addition to its role in religious ceremonies and artifacts, the use of gold in both secular and religious art flourished throughout Europe during the Middle Ages. Indeed, many artists, including the famous Boticelli, were formally trained as goldsmith apprentices. Today there is still nothing like decorating with gold to bring a touch of glamour and warmth to a room. It reflects light and opens up a dull space. 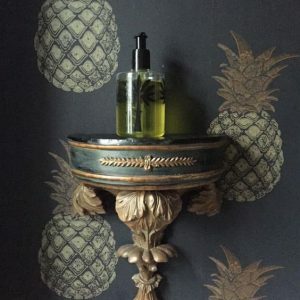 It can be used like a neutral and is best mixed with soft natural colours or textures is a great way of ensuring the effect is glamorous without being bling. Linen, wool and velvet in soft charcoals, natural or earthy reds can be the perfect addition. 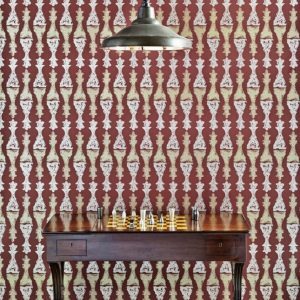 One of my favourite fabric and wallpaper designers who get the balance just right is Barneby Gates, run by ex Vogue Living Editor, Vanessa Barneby who after graduation studied decorative painting, trompe l’oeil and restoration at Hampstead Decorative Arts in London and Alice Gates who studied figurative painting before achieving a Masters in Fine Art at The City & Guilds of London Art School. 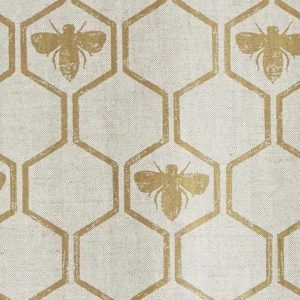 Honey Bees fabric in Soft Gold. Just be careful of too much. 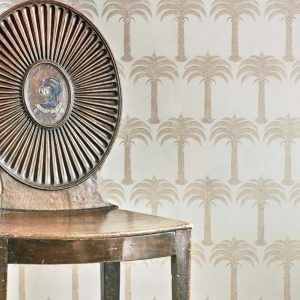 Wallpaper or a fabric with a gold design is certainly enough, don’t be tempted to build gold on gold. There is certainly an art to striking the right balance.